Give Me Liberty or …? before the court for a hearing. habeas corpus in the interest of public safety. Congress had been out of session when the crisis began. necessary and appropriate ever since. Don’t miss out . 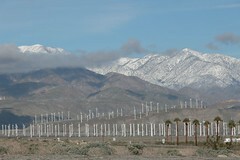 . .
it at a ridiculously low cost, now is the time. 877-99-LEARN and talk to one of us in person. I got all ready to go to the airport for the trip to PS this morning. All packed, only running five minutes late. Checked in for my flight via the web, naturally. We got started, and were about two miles into the 50 mile trip to the airport. I decided to make sure I had my license and boarding pass in a handy pocket. Boarding pass: check. Drivers license: not check. My frigging drivers license has gone missing. I tell Bob to pull over so we don’t get any farther from home. I dig through my purse, dig through the car, pat myself down, and come to the conclusion that there is no drivers license to be found. We turned around and went back home, where we went through everything. No DL. I tried to cancel, there are no numbers anywhere for something like that. The ticket sales woman on the phone said that since I checked in, the only way for them to know I was not going to fly was to not be on the plane when it took off. Stupid. But it was a refundable ticket, so I’ll try and rebook for tomorrow. Some hours later I’m back from DMV, with a temporary license. I hope Alaska will let me on with a temporary drivers license. No picture, so it should be interesting. No flights left SMF to PSP this week. Crap. Southworst it is. Um, one more update: I found my damned license. It was in the copy machine. Sheesh. 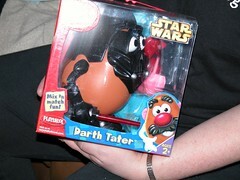 Here it is: Darth Tater, a lovely Mr. Potato Head figure. I just about split a gut when I opened it. Well, it’s another Christmas in the can. All is well, merry and bright, even. Dinner was good, presents were fun all around, it’s good to be us. 🙂 Merry Christmas, one and all! A man enters a bar and orders a drink. The bar has a robot bartender.